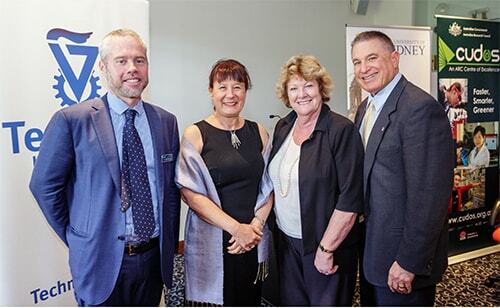 Professor Benjamin Eggleton, Director of CUDOS, Ruth Ratner, President Technion Australia (NSW), Jillian Skinner, NSW Minister for Health and Mr Lawrence Jackier, Chairman of the Technion Board of Governors at the announcement of the research partnership.Image: Robert Catto. The development of groundbreaking communications systems for the next generation of computers is the goal of research collaboration between the University of Sydney and Technion - Israel Institute of Technology. The NSW Government will contribute $300,000 to the photonics research project between the Australian Research Council Centre of Excellence for Ultrahigh Bandwidth Devices for Optical Systems (CUDOS) at the University of Sydney, and Technion. The project was launched by NSW Minister for Health and Medical Research, Jillian Skinner, at an official event at the University of Sydney yesterday. Photonics and optics are used throughout communications networks, using optical fibres as light pipes and lasers to generate light pulses that carry information. Optical interconnects harness photonics for communication within computers and on chips to deliver the increased computing speeds that are demanded by society. "This partnership allows us to work together on fundamental aspects of nanophotonics towards realising chip-based optical interconnects which can revolutionise computing - dramatically increasing the available bandwidth and, therefore, processing speed," said Professor Benjamin Eggleton, director of CUDOS. "We will explore new science at the frontier of photonics that will help realise radically new functionalities and improved performance for on-chip photonics." "CUDOS and Technion researchers already have reputations as champions in nanophotonics and optical physics - both in terms of fundamental discoveries and technological impact in areas ranging from communications, to defence and security, and medical imaging," Minister Skinner said. "NSW and Israel have proven research strength in the fascinating field of photonics, share similar academic and industrial landscapes, and well-matched entrepreneurial cultures driving innovation. "That is why the state government, through the Office of Science and Research, will contribute $300,000 over three years to set up the NSW-Israel Collaborative Research Pilot Program. "This is a relatively small investment, but has the potential to reap significant rewards for NSW through scientific breakthroughs and commercialisation outcomes," she said. NSW Chief Scientist and Engineer, Professor Mary O'Kane, said, "These extraordinarily talented researchers from both institutions will come together in a bid to develop light-based communications systems, which sit on the surface of a computer chip, to drive the next generation of computers," said NSW Chief Scientist and Engineer, Professor Mary O'Kane. Dr Ruth Ratner, President of Technion Australia (NSW), said, "To be able to support a project such as this - a project with such enormous potential to share the knowledge of two of the world leaders in exploring and developing the technology of the future, is thrilling. The potential benefits to the people of NSW and Israel, and beyond, will be great." CUDOS is a research consortium of seven Australian universities based at the University of Sydney and a world leader in research in on-chip photonics, for all-optical signal processing. The Technion was recently ranked sixth in the world for entrepreneurship and innovation, and awarded the Israeli Government's I-Core Centre of Excellence for Photonics Research.